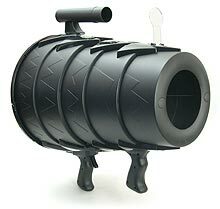 Megazooka is a improved, and bigger and meaner version of Airzooka, a product of air bazooka by ThinkGeek. Megazooka is almost the same with Airzooka, with an additional new trigger action which allows you to wait in position and take aim while waiting for the air assault warfare to begin, waiting for target to be in sight. The extra is double handle grips and pop-up sight. As with other air bazooka, Megazooka requires no batteries, no electricity, and simply needs air.